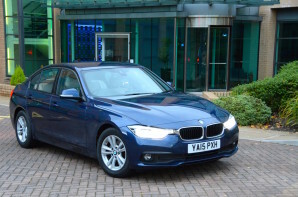 For more than 30 years the BMW 3 Series has been the benchmark compact premium saloon with its reputation being firmly built on combining luxury with a playful rear-wheel drive chassis. More recently this has been combined with excellent fuel economy, which gives the seventh generation a lot to live up to. The 3 Series has traditionally managed to avoid the marmite styling that has afflicted the 1 Series, and the latest iteration of the ‘3’ is no exception. The biggest departure is the new nose with wider kidney grills that join the elongated headlight units. It is a contemporary look but one that will also age well. Under the skin the 3 Series has grown a bit but is no heavier than the outgoing model. The latest 150 hp 2-litre diesel engine delivers strong official fuel economy and good performance; it doesn’t move the game on but BMW had already set the bar very high. However in key areas the 3 Series has moved forward. BMW’s love for run flat tyres had a noticeable effect on ride quality, but the latest run flat tyres contribute to a much improved ride without affecting the fun. The 50:50 weight distribution, rear-wheel drive and feelsome steering all remain, making the 3 Series the default driver’s choice. Bigger, better looking, and plusher are good starting points. When combined with one of the most communicative and adjustable chassis in any saloon car and excellent fuel economy it is going to take a lot to topple the 3 Series from the top of the tree. The 3 Series blends fun with environmental responsibility better than any rival.